Posted on October 29, 2014 by No Map Required Posted in Places, Tanzania, Zanzibar	. 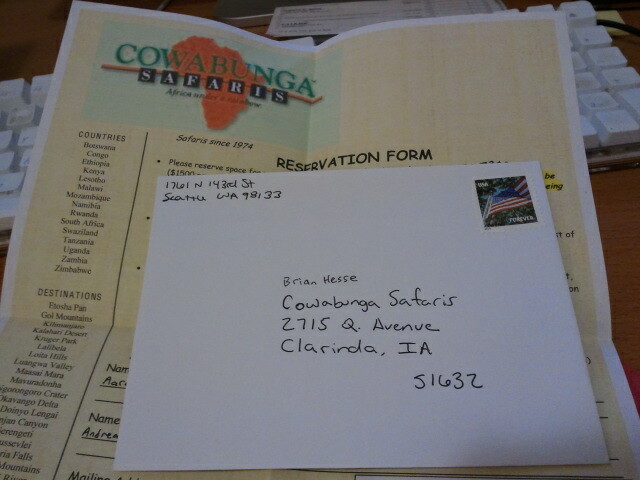 Registering for our African safari with Cowabunga Safaris!!! Check out the tour at Cowabunga Safaris. Me, I’m back to packing! Excited, I’m sure. A little nervous perhaps? ABSOLUTELY EXCITED!!! We’re actually not nervous about the safari at all – we’ll have already been traveling for 6 months by then, so we should be quite happy having 11 days with no planning needed on our parts! Absolutely a thrill, but don’t think you’re getting out of seeing us! Our whole plan is based on seeing you at the end of July/beginning of August! With all of Africa to explore (well, not west Africa), we shouldn’t have ANY trouble filling our time ’til you get there!!! Count on seeing us there! Wishing the best adventure ever!!! Will miss you terribly…but looking forward to your posts!! We will miss everyone, for sure! We can’t wait to see what’s around the next turn – bring on the adventures! One of the very last things we did before boarding the plane to Atlanta was purchase a new camera with extra long zoooooom! Now, I just have to stop Aaron from all the photo-bombing and we’re good to go! And so the adventure begins. Have a FANTASTIC time you two!!!! Thanks, Jennifer! We’re loving living it and sharing it with everyone – thanks for following!